Steel production rose marginally in May but company bosses say the industry is far from a turnaround because of the fall in global prices. 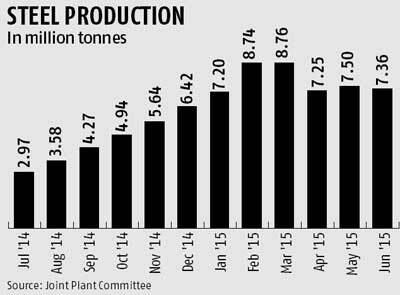 The main reason for domestic production rising in May is commissioning of new plants. “Once a unit is commissioned, it has to be kept running. This has nothing to do with increase in demand for the commodity. A commissioned plant cannot be kept idle,” said Ravi Uppal, managing director and chief executive officer of Jindal Steel & Power. The Delhi-based company produced 1.10 million tonnes (mt) of crude steel in the June quarter, up 38 per cent from the corresponding period last year. Most of the production came from its Angul and Raigarh units, with Oman also contributing a fourth of the total output. Increased production by other companies like Steel Authority of India, Essar Steel and Rashtriya Ispat Nigam is another reason for the rise in domestic output. According to Joint Plant Committee data, domestic integrated producers together produced nearly 12 mt during April-June, 4.3 per cent more than the corresponding period last year. In May alone, these companies produced 7.5 mt, up 1.7 per cent year on year. Early this month, Chinese hot-rolled coil prices hit a 16-year low, while the benchmark CIS and China HRC export prices were at 10-year lows. “There is no benchmark price as such for steel because it has several grades, but domestic steel prices are Rs 2,000 more per tonne than imports, making the situation difficult for domestic producers,” said an analyst with a local brokerage. Each time the gap between imported and domestically produced steel widens, domestic players have to adjust to bring in parity. 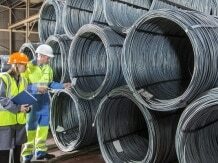 The Joint Plant Committee is empowered by the ministry of steel to collect data on the domestic iron and steel industry. While production rose at home, cheap imports from China, Japan and South Korea continue to swamp the market. “Prices of domestically produced steel are under tremendous pressure,” said Uppal. In the quarter ended June, imports rose 53 per cent, year on year, to 2.54 mt. Despite a rise in consumption, domestic producers are unable to tap the opportunity due to cheap imports. “There is some traction in small infrastructure projects along with medium and heavy vehicles, but the incremental demand is going to imported steel,” said Jayant Acharya, director, commercial and marketing, JSW Steel. Overall, demand growth for steel is expected to double in 2015-16 from three per cent in 2014-15 but how much of it will be captured by the domestic industry needs to be seen. “If the current scenario continues, our margins are going to remain impacted. In April-June, too, margins remained under pressure,” said Acharya. In the June quarter, India’s steel consumption rose seven per cent, year on year, to 20 mt. Industry executives are hopeful the peak demand season between October and March will bring in some respite. “October-March is an important period as much of planned expenditure is rolled out in this season. How we benefit depends upon the supply scenario,” said Acharya. With July-September monsoon season being a lean period for construction, industry executives do not expect strong demand for steel. Executives were unable to predict the direction for prices. Some said prices had bottomed out and would only move in a range-bound manner. “It is difficult to say how prices will behave. The entire sector’s future will depend on that,” Uppal said.